Here's the latest from the UC ANR Topics in Subtropics blog written by Ben Faber, Farm Advisor, UCCE Ventura County. 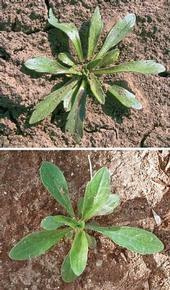 Researchers have now confirmed that six glyphosate-resistant weed species have been identified in California. Four have been known to exist for some time; they are horseweed (marestail, Conyza spp. ), hairy fleabane, rigid ryegrass and annual ryegrass. To that list, junglerice and Palmer amaranth in the Central Valley have been recently added to the list. Additional weeds that have become more of a challenge to control and are on the suspect list are goosegrass and, in the central San Joaquin Valley, the summer grasses sprangletop and witchgrass.